Where should you invest your money? 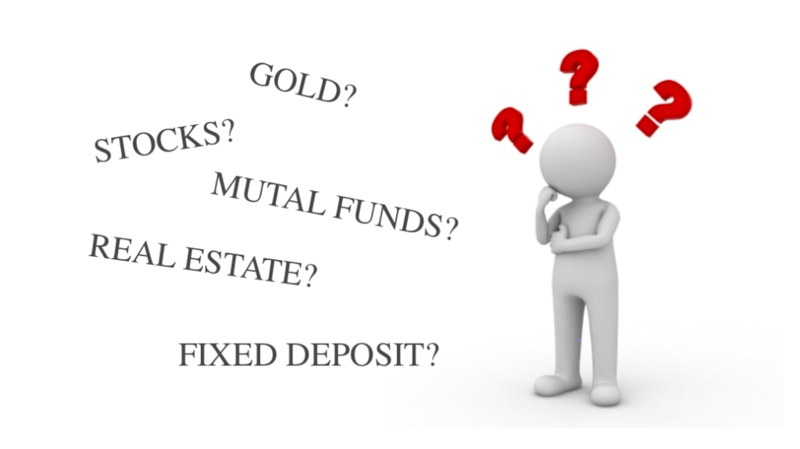 This is one of the most popular questions for anyone new to the investment world. Everyone has their own living style and financial dreams. Some people are frugal while many are spendthrift.Some people live their life below their means and save money. While there is another group of people who spend a lot of money every weekend in parties and outings. They do not care about savings and have a huge credit card debt. However, there are not only two kinds of people in this world. There are also many people whose spending habits lies between that of the extremes. In this post, I am going to give a simple answer to this question- ‘Where should you invest your money?’ So buckle up and plan your financial journey ahead. Before you decide where should you invest your money, you need to define your investment goal. Your investment amount will depend a lot on your goals. Your goal can be anything like buying a new car, buying a new house, savings for marriage, to fund your higher education, retirement or even just for fun. Now depending on your goal, you will have to adjust your investment amount. If you are investing to fund your higher education (after 2-3 years), then you need to ‘save more’ and ‘invest frequently’. Here the time horizon is small and hence the power of compounding will not be that helpful. On the other hand, if you investing for your retirement, then even the small investments will add up to a huge sum when compounded over a large period of time. This is the amount of risk that you are willing to take. Not everyone believes in ‘high risk and high reward’. Many people want minimum risk for their investment so that they can a sound sleep. Your risk appetite will decide your investment style. We will discuss the risks involved in different investment options later in this post. If you have a huge debt like education loan, car loan, house loan etc, they pay it off first. There’s no point getting returns from your investment and directly giving it back to your lender. Therefore, get rid of your debts first. Next, your investment decision will depend a lot on your financial situations. If you have dependents, then you might first need to have insurances, LICs etc. If you are single with no dependents, then you can invest without any worry. Moreover, you will also need emergency fund so that you can have some financial flexibility. The longer you remain invested, the greater will be the returns. The time horizon of your investment will vary with your age. If you are in your 20s you will have long time horizon compared to people who are in their 40s and just starting to invest. There is a famous thumb rule of asset allocation while investing. This is called ‘100 minus your age’.It says that the total percentage of your investment should be equal to 100 minus the age times of your net worth. For example, let’s say that you are 28 years old, then you should invest (100-28)= 72% of your net worth and keep the remaining in your saving account. This rule is based on the philosophy that as you grow old, your needs will increase (like children’s tuition fee, children’s marriage, house debts etc) and hence you won’t be able to invest much. Therefore you should invest more when you are young and have minimum liability. This is a low risk and low return investment. You can expect a return of 6-8% per annum by investing in FDs. The capital invested in FDs are considered to be safe if you do not count inflation and taxes. Investing in the stock market involves high risk and high returns. You can expect a return of 15-20% per annum by investing in stocks. Investing in stocks has been a life changer for many people. 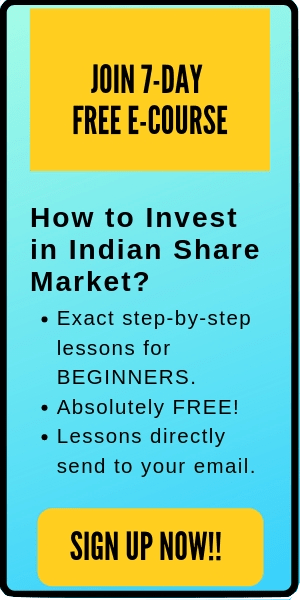 Although a number of people have lost money in stocks, however, many of the billionaires in India created huge wealth by investing in stock market. New to stocks? 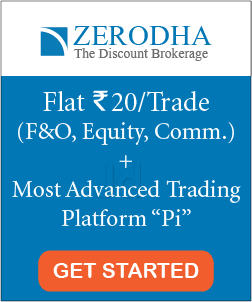 Here is an amazing course on the stock market for beginners: How to pick winning stocks? Enroll now. This is a moderate risk and high return investment. You can expect a return of 10-14% by investing in mutual funds. These funds are managed by highly qualified fund managers and hence it doesn’t require much involvement of the investors. However, these funds are also subjected to market risk. This is one of the conventional ways of investing which has been followed over thousands of years. This is a low risk and low return investment. The best part of investing in gold is that- it will always retain its face value. Moreover, it is easily acceptable and highly liquid. You can sell your gold jewelry, gold bar or gold coin to any of your neighbor jewelry shop. The only disadvantage of investing in physical gold is its safety. Nevertheless, after coming of GOLD ETFs, even this problem has been solved. Also read: Getting Smart With Investment in Gold. This is a low risk and high return investment. One of the best option available in a growing economy like India. If you buy a property and hold it for 10-15 years, your initial investment can give multiple times returns. In many developing cities, the prices of a flat double itself just in 2-3 years. Overall, the returns from real estate investment are tremendous. However, the two big problems with real estate investment are high initial investment amount and liquidity. You cannot find a seller for your property in a day and it takes time for the paper works. Nevertheless, don’t stop yourself from investing in real estate just because of these two reasons. The return on this investment is amazing. Moreover, if you do not own a house, it can be one of your biggest investment. Stocks and real estate investment are the ones which have given the best returns in the past. You can find a number of millionaires who made their fortune by investing in stocks and real estate. However, you will hardly find anyone who created huge wealth by investing in FDs, mutual funds or gold. The other options available in India for investments are currencies, commodities like silver, metals, crude oil etc. In addition, it’s better to invest in more than one option. You can own a property and remain invested in stocks at the same time. Like the elders say -’Do not put all your eggs in one basket’. This is one of the best advice of all time. No investment is completely risk-free. However, the severity of the risks is different in different investment options. Select the investment option carefully depending on your investment goal, risk appetite, time horizon and current financial situation. Take advice from your financial advisor or knowledgeable friends. But make your own financial decisions. Remember, no one cares more about your money than you do. That’s all. I hope this post on ‘Where should you invest your money?’ is useful to the readers. Please comment below if you have any questions. I will be glad to help you. Awesome Blog! Thanks for sharing it.